As an Australian girl dreaming of wandering the globe, its always exciting to hear from Australian's living abroad and embarking on exciting journey's. Australia-born, Graz Darken has now been in London for 14 years and recently created Slices London. Slices London is rather more than just a collection of scarves as they encompass the beauty of both art and fashion. Remixing scientific microscopic views into artistic prints for scarves for the fashion world, Darken has displayed the natural beauty from within and the world around us. 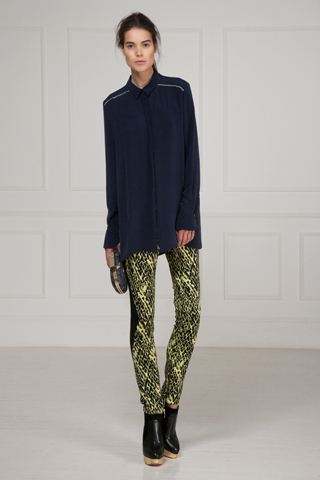 To my excitement of discovering and learning more about this brand, I found out they were stocked at BELINDA, Sydney. 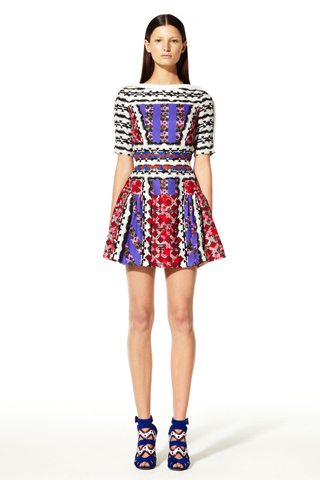 As any fashion loving girl would... It was the perfect excuse to visit some shops around the CBD and pop into Belinda for a quick visit. Find your favourite Slices LONDON scarf at Belinda stores, Sydney and Melbourne. now that's a little kwerkee! 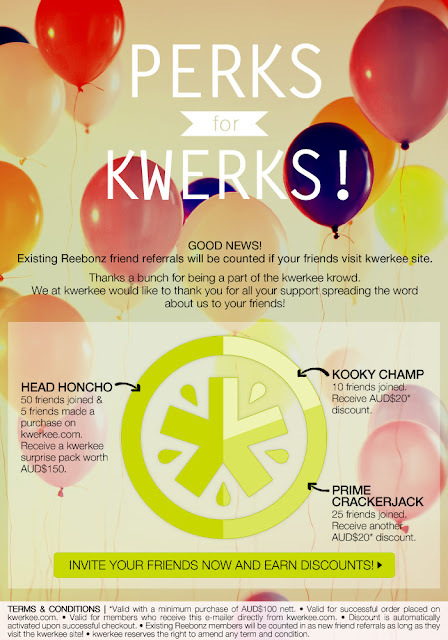 Kwerkee claims that it may cause fits of excitement and that it did! As my online shopping parcel arrived, I sensed my inner child skipping around my brain singing like one would on their birthday. Well, I did order a fisheye camera and a red heart umbrella! A red heart umbrella by INCIDENCE PARIS and a white LOMOGRAPHY fish eye camera will surely send a smile your way. Kwerkee has items available for a limited period of time and upon browsing the sometimes cliche items, it's time to purchase (yes, that fisheye camera that will bring many laughs) The site was very user friendly and and easy to use. The parcel was well packaged and arrived quickly from an offshore destination. The unique yet novelty items found on this site seem to be a rare collection of products that have left me shopping in joy. How could I go past this ray of sunshine whilst listening to Ellie Goulding 'Bright Lights' album? Is orange and pink your colours? 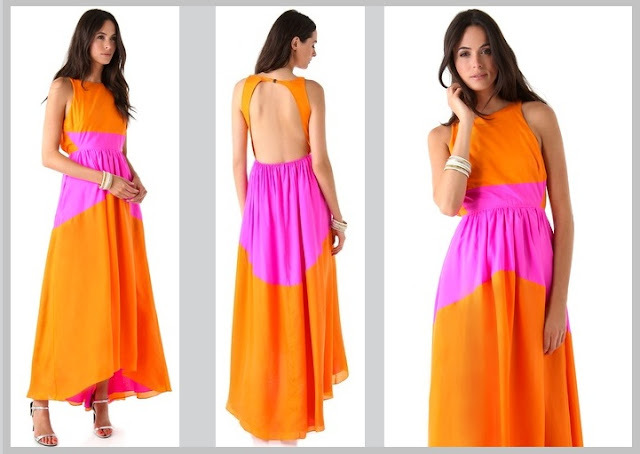 From a summer vacation to an island getaway or the event that calls for a burst of colour, this Tibi dress is one that you can not go past and neither will the people that you meet whilst wearing this long dress. With a cut out on your upper back, you will be flashing just the right amount of skin as you swan your way through a fun evening. 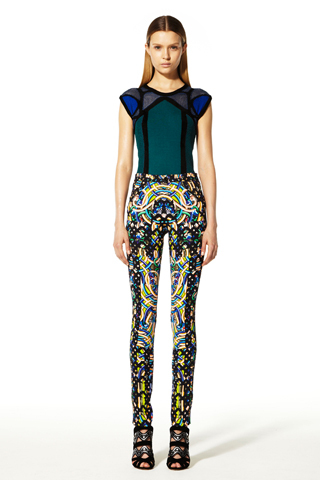 A burst of colour can be easily injected to an outfit. 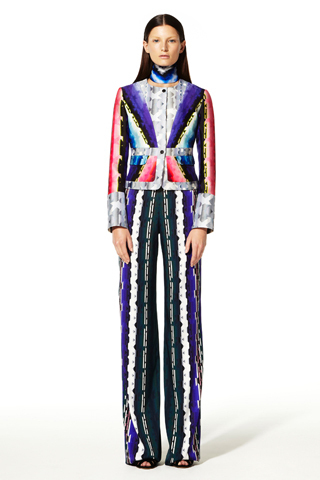 If the above dress may take you too far out of your comfort zone? 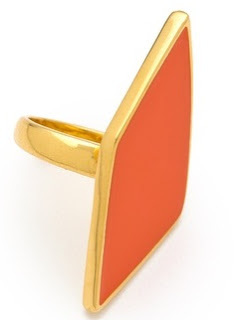 But you do like colour... A bold coloured accessory may be just right. This Marc Jacobs pink rubber bracelet with silver embossed logo charm has the ability to accent your style with a small amount of colour with just as much fun. 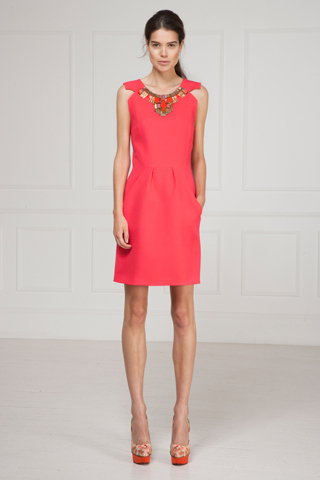 Also available in red :) I'm sensing an addition to the arm candy in my closet. Here is a few more pieces to add colour to your wardrobe. Chloe FALL collection is almost available, this may be my favourite look but the collection is slightly unexpected but as always with the elegance of the Chloe signature. 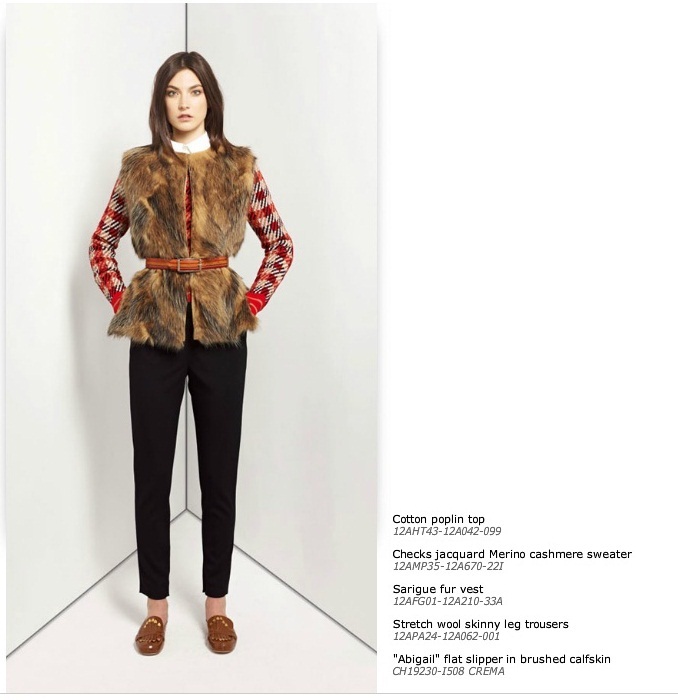 From checks to textural fur vest cinched in with a tan belt styled with the perfect black pant, a relaxed warmth is showcased to escape the winter chill. And a flat tan slipper [Yes, I do love tan] , what more could you want...? 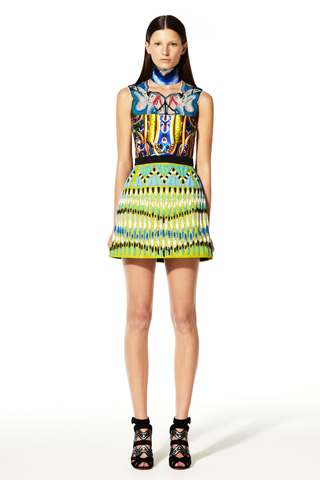 Your daily dose of need to know is designer, Peter Pilotto. 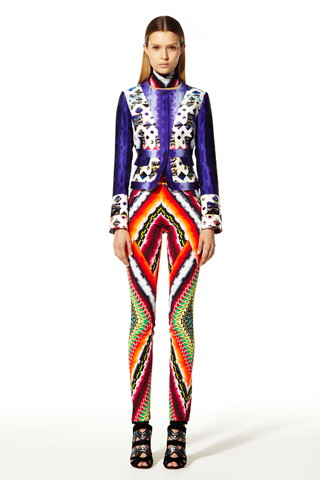 The Resort Collection 2013, or should I say the statement collection? 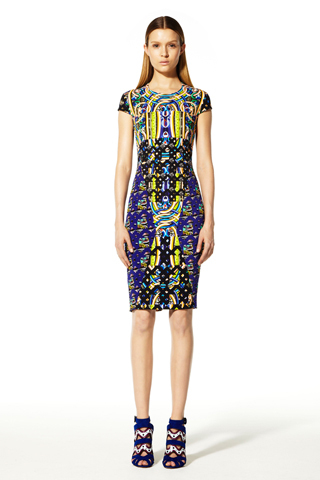 As when you wear any of the following pieces an impact will be made. 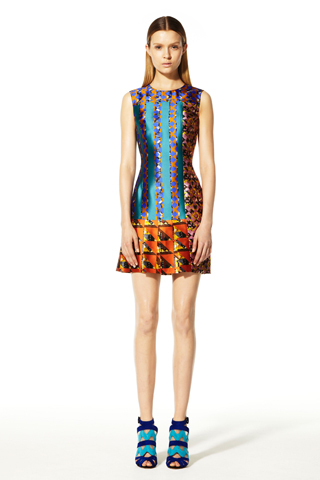 This collection may not yet be available but a selection of Peter Pilotto's creations are available here. 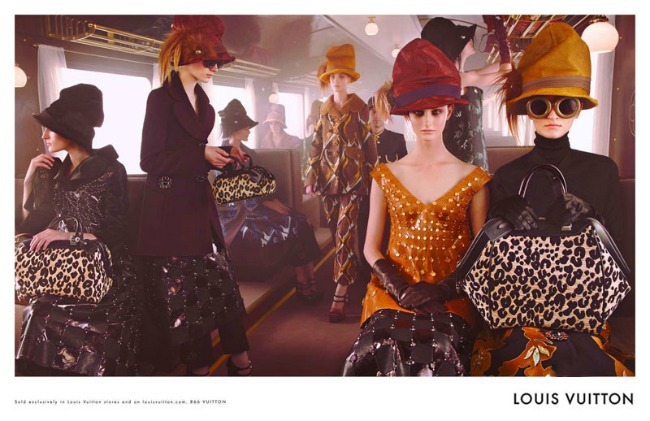 I must say the first class ride along the Louis Vuitton Express is one of fashionable delight. From sculptural hats and women clasping their luxury leather handbags, the mood on this journey is right on track for any style diary. The bold printed pant suit, leopard handbags and the textured fabrications have created a fall sensation bringing elegance to the LV wardrobe this Fall. 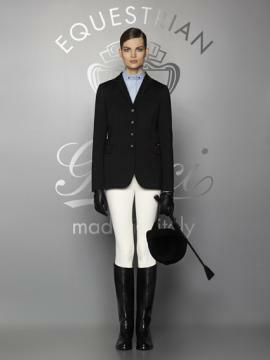 I've never been a horse rider but if I get to wear those boots, I may just dress up and go to the stables! 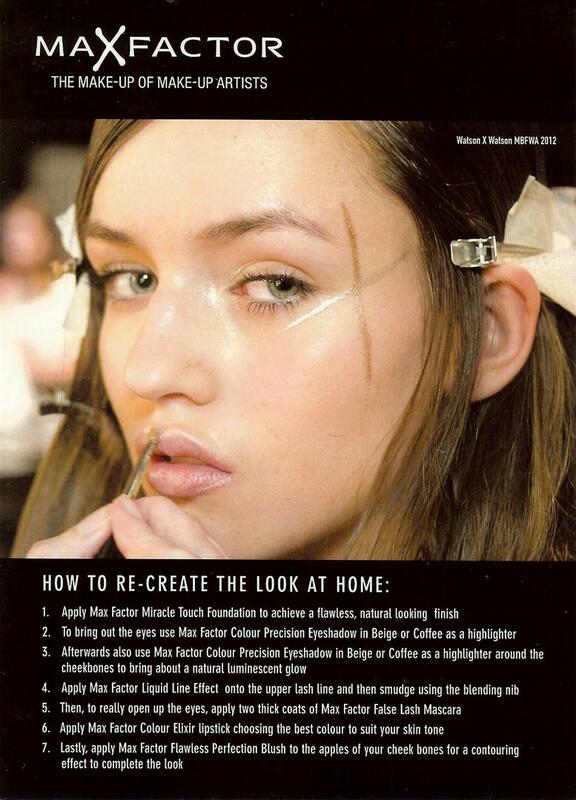 The lovely girls at Rouge Magazine hosted the Max Factor Masterclass with celebrity make up artist Liz Kelsh showing us two looks from Mercedes Benz Australian Fashion Week. 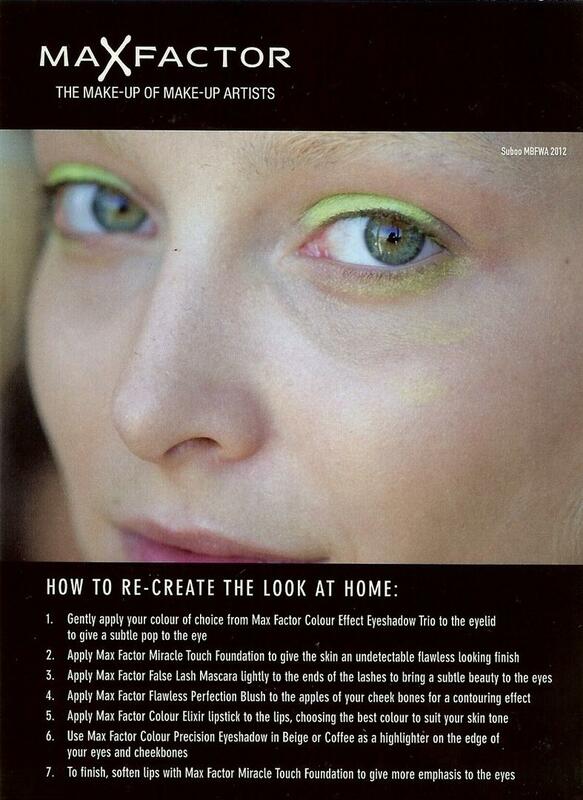 The looks were demonstrated on a model with all attending the class attempting each step as we went along. I left with some new make up tips up my sleeve and some new Max Factor products to play with. I believe I am falling in love with the entire collection. 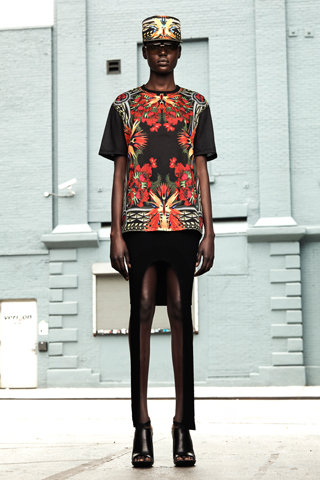 The symmetrical prints and the bold colour choices by Riccardo Tisci's have made this collection a great success. 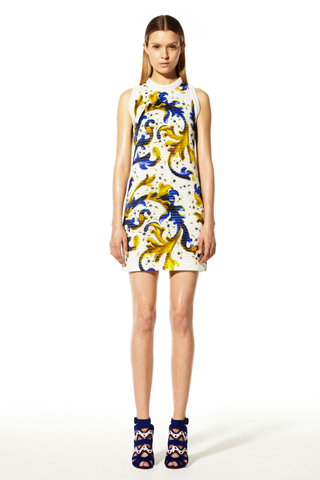 Print, white on white and solid colour trends he has created, are evident.